This Novena begins on the Solemnity of Corpus Christi, Thursday 20 June and ends eight days later on the Solemnity of the Sacred Heart. 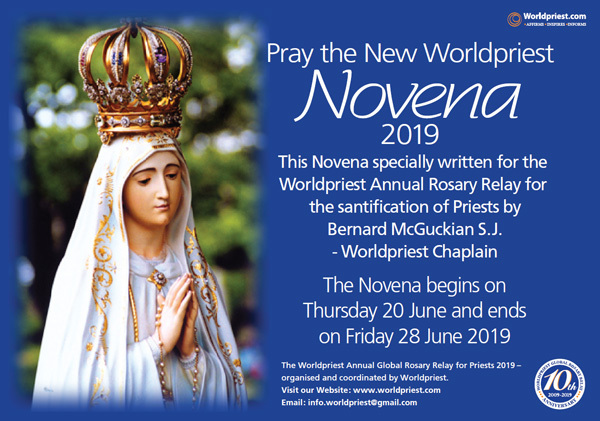 We invite you to join us in prayer for divine blessings on the Worldpriest Annual Global Rosary Relay, scheduled for Friday, June 28th, 2019. REFLECTION: Today’s Feast of Corpus Christi was first entered into the Liturgical Calendar of the Universal Church 775 years ago in 1264. This initiative came from revelations by the Risen Lord Himself to Saint Juliana in her Congregation near Liege, Belgium. To this humble nun, He revealed His desire that a day be set apart to celebrate with special solemnity the Sacrament of His Body and Blood. Although the inestimable gift of the Blessed Eucharist was made possible through the cruel, unjust slaughter of the Lamb of God, for which all of humanity should be ashamed and ask forgiveness, the special emphasis of today’s feast is the joyful celebration of the Supper of the Lamb. Without our priests, there would be something missing in our efforts to respond to this divine call to joyful celebration. So, let us lift up our hearts! Sursum corda! Feast of St Aloysius Gonzaga, S.J., (1568-1591) Protector of Students and Patron Saint of Christian Youth : June 21st 2019. REFLECTION: Aloysius Gonzaga died aged 23 while helping the victims of the plague in Rome. Only five years earlier he had joined the recently founded Society of Jesus. This caused a stir around Europe as he was forgoing a rich family inheritance and his status as a Prince of the Empire. At the time of his death he was pursuing theological studies in preparation for priesthood. However God had other plans. This young man who dedicated himself wholeheartedly to prayer, penance and study was not given the opportunity to exercise his outstanding gifts of both nature and grace as an ordained priest. His calling was to be a model for all the young people. At his funeral, his religious superior said to Martha his mother, “Even if your son had lived to be as old as Noah, he could not have become more holy!” He died on the last day of the Octave of Corpus Christi, the day that would later be named the Solemnity of the Sacred Heart. After his death, Aloysius revealed to another Jesuit student for the priesthood that “devotion to the Sacred Heart is highly valued here in heaven”. St Aloysius, pray for young men preparing for the priesthood, especially those from our own diocese. Father of love, giver of all good things, in Saint Aloysius you combined remarkable innocence with the spirit of penance. By the help of his prayers may we who have not followed his innocence follow his example of penance. May he be an inspiration to many young men who like him have felt called to offer themselves for priesthood in the service to their sisters and brothers. We ask this through Christ our Lord. “In danger, in distress, in uncertainty, think of Mary. Call upon Mary. She never leaves your lips, she never departs from your heart; and so that you may obtain the example of her prayers, never forget the example of her life. If your follow her, you cannot falter; if your pray to her, you cannot despair, if you think of her, you cannot err. If she sustains you, you will not stumble; if she protects you, you have nothing to fear; if she guides you, you will never flag; if she is favourable to you, you will attain your goal”. Homily 11 super Missus est, 17,PL 183 70-71. Lord God, you decreed that the Mother of your Son should stand by his Cross, suffering with him. Safeguard in your family, especially your priests, the fruits of your great work of redemption and in your goodness make them grow daily more and more. We ask this through Christ our Lord. “They shall look on the One whom they have pierced”. John 19:37. Here John the Evangelist quotes a line from a longer passage from the Prophet Zechariah 12:9-11, written around 520 B.C. “When that day comes, I shall set about destroying all the nations who advance against Jerusalem. But over the House of David and the inhabitants of Jerusalem I shall pour out a spirit of grace and prayer, and they will look to me. They will mourn for the one whom they have pierced as though for an only child, and weep for him as people weep for a first-born child”. Some scholars assert that the original inspired words of Zechariah were, “they shall weep for Me whom they have pierced.” Given the context that it was the Lord Himself who was speaking, an influential scribe who was recording the prophecy for posterity changed “for Me” to “the One” whom they have pierced”. He, understandably, considered it impossible that anyone could literally pierce the Lord Himself. We now know differently. With the Incarnation of the Divine Word, it became possible for us to wound the Heart of our God. This is what we have done. And this is what we have been forgiven for doing. Priests have the privilege of forgiving us our sins in the Name of God. Reflection: Today in the Church we honour birthday of John the Baptist, described by Jesus Himself as the greatest man ever born of a woman. The son of a priest, Zechariah and his wife Elizabeth, John’s calling was rather to prophetic witness than to ministerial priesthood. This would cost him his life. He simply reminded Herod of the Sixth Commandment. “It is against the law for you to have your brother’s wife “(Mark 6:18). Like John the Baptist priests are called to witness to the truth that happy family life is rooted in respect for the Law of God. Indeed such families have traditionally been seen as the glory of the celibate priesthood. St John Vianney, the Cure of Ars and Patron Saint of all Priests was so devoted to the great Precursor of the Lord that he took the name, Baptist, at Confirmation, a sacrament which he only received as a mature 20 year old. Final Prayer: O God, who raised up John the Baptist to make ready a nation fit for Christ the Lord, give your people, especially your priests, the grace of spiritual joys and direct the hearts of all the faithful into the ways of salvation and peace. We ask this through Christ our Lord. St Charles Borromeo (1538-1584) is considered one of the great reforming Bishops of the Church. He was ordained priest when 25 years of age in the last year of the Council of Trent, 1563. In spite of much opposition, he vigorously implemented the changes called for by this great Council. Strange as it may seem, he had already been a Cardinal for three years before his ordination, having been appointed to the Sacred College, by his uncle, Pope Pius IV in 1560. St. Charles is an instance of someone who gave “nepotism” a good name! Ordination combined with grief at the sudden death of his elder brother affected him deeply, leading him to adopt an extraordinarily austere and industrious priestly life. It was said of him that he literally lived like a dog in God’s house. He was content with a few crusts of bread, the occasional sup of water and for bedding, a wisp of straw. Besides being Patron of bishops, catechists and catechumens, at a more homely level, he is patron of intestinal disorders. St Charles Borromeo…pray for our priests. We now pray through the intercession of the saints of our own country for our priests. One morning in 1675, shortly after Claude La Colombiere had finished his period of preparation for priesthood in the Society of Jesus, he was saying Mass in the Visitation Monastery at Paray-le-Monial in Eastern France. As he approached the altar, one of the community, Sister Margaret Mary Alacoque distinctly heard a voice: “This man, my faithful servant and perfect friend, is the one I have chosen for you”. For some time she had been receiving visions of the Risen Lord but was disturbed in case they were simply hallucinations. Claude, who would later be canonised by Pope Saint John Paul II some centuries later in 1992 assured her that it truly was the Second Person of the Blessed Trinity with whom she had been in communication. The dealings between these two saints would issue in Devotion to the Sacred Heart of Jesus, one of the greatest gifts to the Church in its long history. This devotion has taken a variety of forms of expressions. Among other developments over subsequent centuries, it has led to the establishment of around 300 new religious orders, male and female with “Sacred Heart” in their title and specially dedicated to spreading this devotion. Writing about Claude after he died in 1682, Margaret Mary said of him, that “he was all-powerful in what had to do with devotion to the Sacred Heart”. St Claude La Colombiere, pray for our priests. Final Prayer: Lord and Father of us all, you spoke to Saint Claude, your faithful servant and perfect friend, in the silence of his heart, so that he might bear witness to the riches of your love. May your gifts of grace continue to enlighten and console your Church. Grant this through our Lord Jesus Christ, your Son, who lives and reigns with you and the Holy Spirit, God, for ever and ever. In the second half of the 17th century, the Lord Jesus appeared several times to St Margaret Mary Alacoque, a humble nun in her Visitation Monastery at Paray-le-Monial in Eastern France. The greatest of her visions took place during the Octave (eight days) of Corpus Christi, 1675. On that occasion Our Lord said:” Behold this Heart that has so loved men that it has spared nothing, even to exhausting itself and consuming itself, in order to testify to its love. In return, I receive from the greater part only ingratitude, by their irreverence and sacrileges, and by the coldness and contempt they have for me in this Sacrament of love…..I come into the heart I have given you in order that through your fervour you may atone for the offenses which I have received from lukewarm and slothful hearts that dishonour Me in the Blessed Sacrament”. Reflection: We recall the Lord’s revelation to St Margaret Mary of His desire that a special Feast in honour of His Sacred Heart be introduced into the Liturgical Calendar of the Church. With the help of her religious sisters and a number of zealous priests she took the necessary steps which eventually led to the establishment of the Feast of the Sacred Heart almost two centuries later. Eventually in 1856, Blessed Pope Pius IX authorised the celebration of this great Feast in the Universal Church..
St Margaret Mary, pray for our priests. Final Prayer: Pour out on us and especially our priests, O Lord, the spirit with which you endowed Saint Margaret Mary, so that we may come to know the love of Christ which surpasses all understanding and be utterly filled with your fullness. Grant this through our Lord Jesus Christ, your Son, who lives and reigns with you, in the unity of the Holy Spirit, God, for ever and ever. We recall the Great Promises made by the Lord Himself to St Margaret Mary over the course of the several occasions when He appeared to her.. The following Twelve Promises are on offer to all those who practice devotion to the Sacred Heart. 12. I promise you in the excessive mercy of My Heart that My all-powerful love will grant to all those who communicate on the First Friday in nine consecutive months the grace of final penitence; they shall not die outside My grace nor without receiving their Sacraments. My Divine Heart shall be their safe refuge in this last moment. (This 12th Promise is referred to in the Bull of Canonisation of St Margaret Mary on Sunday, May 13th, 1920. Pope St. John Paul II, noted for his devotion to the Sacred Heart was born five days later). Final Prayer: Grant we pray, Almighty God, that we, who glory in the Heart of your Beloved Son and recall the wonders of his love for us, may be made worthy to receive an overflowing measure of grace from that fount of heavenly gifts. Grant this through our Lord Jesus Christ, your Son, who lives and reigns with you in the unity of the Holy Spirit, God, for ever and ever.